Joyful though it is, maintaining a garden can seem like a never-ending task – however, with the right gardening tools in your arsenal, it needn’t take forever or leave you sore, which is why we’ve made our list of the best gardening tools available to make scarifying a cinch and pruning positively painless. Of course, what you’ll be looking for in a pair of shears won’t be the same as in a rake, so we’ve made a note of the main selling points for each of our picks to help you decide which is worthy of a place in your tool shed. 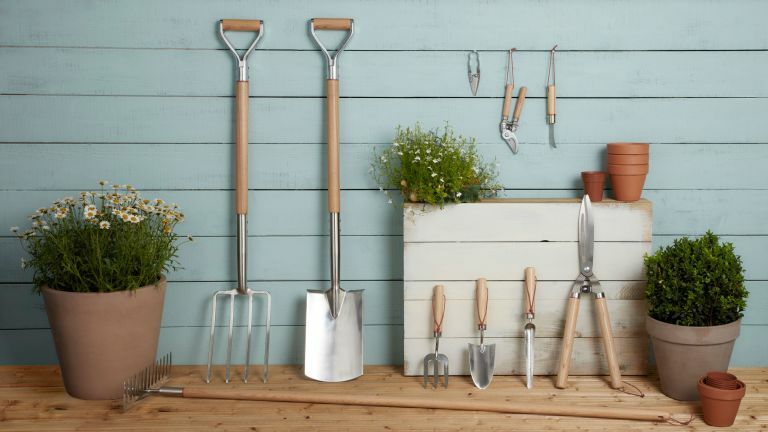 When you've picked the tools you need, head to our sourcebook of top garden suppliers for more garden-related shopping. Even if your garden is on the smaller side, or you have no great plans to alter the landscaping any time soon, there are a few tools that’ll come in handy no matter what. For pruning back plants to encourage growth and keeping shrubs neat, our top choice is Felco’s Model 12 Secateurs, while anyone looking to keep their lawn neat come autumn will appreciate a helping hand from Bulldog’s Springbok Lawn Rake – if you’re not looking to make a great investment, we say that’s a good starting point. If you’re after trimmers, edgers, or something a little more specialist, keep reading for our picks. You might not think there’s much to a pair of secateurs, but picking up a cheap pair at the till in the garden centre can prove a surprisingly costly mistake when you find out they’re uncomfortable or impossible to use. These Felco secateurs are the best of the bunch thanks to their innovative rotating handle, which is said to reduce pruning effort by a third, lessening the risk of tendonitis. You can rest assured that its blades are up to scratch too, with a toothed centre-nut to align and anvil blades for what Felco promise is a ‘clean and precise cut’. It was even voted “best tool of its kind” by the Good Design Guide, and we’d be inclined to agree. We have more of the best secateurs in our buyer's guide. Digging into extra-firm earth is no joke, especially if it’s full of plan-foiling grit, small rocks or gravel. This Xact Digging Spade by Fiskars is specially designed to see off such challengers thanks to an extremely durable construction and clever design. With a super-hard boron steel blade, welded to a shaft of steel and composite; an easy-to-grasp Push-Pull handle, and a non-slip step board to make sure those wellies get maximum traction, it’s intended to make short work of tough ground, while the finely sharpened edge cuts through any rogue roots. Well-balanced, perfectly sized, solidly made, and frighteningly sharp – that’s what reviewers have to say about ARS’ Ultra Light Professional Shears, so let us elaborate. These shears aren’t cheap, but if you’ve only ever used inexpensive blades before, users promise they’ll be a revelation. The pipes are ergonomically designed to minimise hand fatigue and the high-carbon steel blades are expertly proportioned with the long handles for leverage, making for a comfortable cutting experience. Reviewers also commented that they were surprisingly light, so if you have a lot of ground to cover in your garden, consider these. This border fork might have a handsome traditional look, but it’s precision-engineered to meet all sorts of challenges. The stainless steel head makes digging in damp soil less of a sticky situation by reducing the amount of earth that clings to its prongs, while also resisting rust, and the wooden handle is weatherproofed to last an age even in less well-sealed sheds. That’s not to say we’re ignoring the design altogether of course – how could we? With its comfortable and elegant wishbone handle and natural wood finish, it’s among the best-looking garden forks we’ve seen. Removing dead grass, or de-thatching, or scarifying, might not be everyone’s favourite job, but it is a necessary step in getting a Wimbledon-worthy lawn, and this Bulldog lawn rake helps to make it less painful than you might anticipate. Reviewers’ big impression was of how well-made the Springbok rake is, remarking on the comfort – from the sustainably sourced ash handle – and the flexible strength – from the riveted metal head – both vital features when tackling tough garden jobs. Light to lift but fearless in the face of stubborn roots and soil, reviewers found this pick mattock tool to be adept at all manner of jobs, from pulling up stumps to excavating huge amounts of chalk. With a heavy head and a lightweight fibreglass handle to minimise vibrations from heavy hits, users were impressed with how well it struck a balance between capable and comfortable, and loved that the head had remained tight to the handle after extensive use – good news when it comes to safety in the garden, nobody wants a pick flying off through the kitchen window! Trowels are endlessly useful things in the garden, handling everything from transplanting seedlings, to potting, to cutting through straggly roots to make room for new plants, so you want to make it a good one. This Spear & Jackson trowel fits the bill admirably, with a mirror-polished stainless steel head that’s not only strong and durable, but sleek enough to guard against annoying soil adhesion, and resistant to rust. The polypropylene handle is ergonomically designed for wrist comfort too, meaning you can dig to your heart’s content. Sure, if you have an extra large plot (lucky you!) then you might want to look into getting yourself a mechanical lawn edger, but this manual version is easy both on the wallet and on the eyes. Its traditional design comes courtesy of a smooth ash-wood handle, complete with beautiful natural grain, and sleek, high-shine half-moon blade, but it’s certainly not a case of style over substance though, and while the finely-ground blade edge makes for effortless cutting, the tempered steel keeps things durable in the face of damp beds.